of the Congo to the 2012 United Methodist General Conference in Tampa, Fla.
Rugabirwa and Antoine Gisore. A UMNS photo by Mike DuBose. 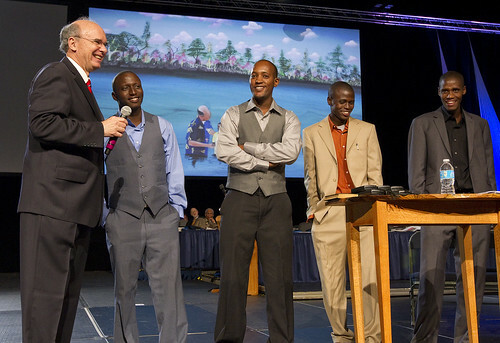 TAMPA, Fla. (UMNS) - Five African teenage refugees who survived a massacre and committed to a new life in Christ as they were baptized in a chilly New Hampshire river are part of what United Methodist Bishop Peter Weaver calls a "resurrection revolution." Delivering the Episcopal Address to the 2012 General Conference April 25, Weaver, who oversees the denomination's New England area, pointed out that New Testament scholar N.T. Wright called the mission of the church the "outworking" of resurrection. Weaver claimed that description for the baptismal experience in the hip-deep waters of the Contoocook River in New Hampshire. Folks in the town of Contoocook were curious about the spectacle, but they did not know, he said, "the resurrection journey that had brought these teenagers and this church to this place." As the bishop described the journey, drawings on the screens surrounding him illustrated his message. The drawings were created by James Makuac, a former "Lost Boy of Sudan," who, Weaver later said, had used photographs of the baptism as a guide and expressed the story "through his own heart and his own art, in African style." Genocidal conflicts between the Hutu and Tutsi tribes had driven the teens from their homes and Methodist churches in the Democratic Republic of Congo. Then, rebels attacked the refugee camp where they had sought safe haven, killing 166 people, nearly one-fourth of the camp's residents, and wounding hundreds more. "In the wake of this horrendous act, The United Nations resettled many of the survivors, some on the other side of the globe in New Hampshire," the bishop said. "There, half a world away from their homes and churches in the Congo, another vital United Methodist congregation&ellipsis;welcomed these immigrants." Weaver grew teary as he described the river baptism, how the life of one teen was saved because he was shielded by his father's body and how another of those baptized was born that night after the gunman about to kill his mother ran out of bullets. Then he brought four of those teenagers -- Makopa and Byishimo Rugabirwa, Antoine Gisore, and Musafiri Musore on stage, where they were greeted with a standing ovation from General Conference participants. Weaver referred to the holy conversations that would begin later in the day and reminded his audience that despite the legislative nature of the gathering the real connection among church members is spiritual, not political. "Before any of us had a resolution in our hands to vote on, we had a resolution in our hearts to devote ourselves to the living Christ," he said. Eastertide - the 50 days between the celebration of the rising of Christ and Pentecost - is a perfect time to gather by the tidewaters of Tampa Bay, he noted. "Eastertide is a powerful time but also a time when out of the ocean of God's love comes a surging tide of rising resurrection life," he explained. "If God can bring to life the Crucified Christ, surely God can bring to life a calcified church," Weaver said. "Resurrection defines who we are, our identity." The connection among United Methodists comes directly from being "one in Christ," not from agreeing on every issue that will be presented on the legislative agenda. "Some of us are here in pain, some of us are hopeful, some a mixture of both, but all of us are one," he said, adding "for the sake of the Risen Christ who first loved us, let us love one another." Weaver said he was more disturbed about the decline in "deep discipleship" than the membership decline in some segments of the church. "Where growth is most transformational, it reflects more than quantity; it is infused with this resurrection quality of discipleship." The central question, he added, "is how The United Methodist Church will be shaped to be more effective in fulfilling God's resurrection mission with God's resurrection people in this changing time." It also means, as it did when the first episcopal address was presented 200 years ago, to "do everything as in the immediate presence of God," Weaver said.